RIO DE JANEIRO, BRAZIL – When it comes to music in Rio, there is one place always on the tip of everyone’s tongue, for visitors and Carioca alike, Lapa. Arcos da Lapa (arches of Lapa, or just Lapa as it is commonly known) continues to be one of the best areas in Rio to enjoy good food, cold drinks, and great live music from all genres. 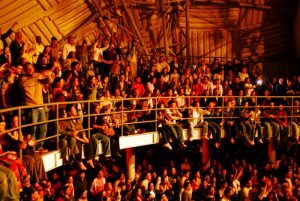 The legendary Lapa venue Circo Voador completely packed, photo by Cristina Granato/Circo Voador. The area has changed a lot in the last few years, from the 2010 Shock and Order “Lapa Legal” program, to the continuing restoration projects beautifying the neighborhood. Yet the music remains edgy and in 2012 the area promises to deliver more of the same, with a few nice surprises. 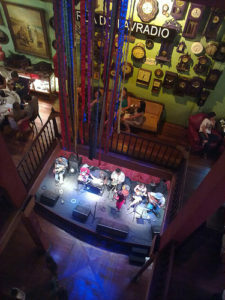 Lapa is home to some of the most notable Rio music venues, but also includes smaller bars and clubs where music fans can catch great live performances. One of Lapa’s musical institutions, Circo Voador (Flying Circus), celebrates its 30th anniversary this year. In 2012, the venue continues its tradition of attracting an eclectic mix of Brazilian and international artists. Brazilian legend Jorge Benjor finished two nights at the venue last weekend, and 2011 saw shows from international acts like The National and Primal Scream. Throughout 2012, many up and coming American indie rock bands will make their debut performances at the Circo. Circo Voador is not the only massive venue in Lapa; Fundição Progresso (difficult to translate, Fundição refers to metal smelting as the theater originally housed one of Rio’s metal factories) is another large venue in the area. The theater is big and industrial, but has a great feeling always with a big group of people dancing. Fundição, like its Circo Voador neighbor, also brings in large local and international traveling acts. Morrissey will perform early in March, Anthrax and the legendary Misfits in April, in between, and throughout the year, a great mix of performances and weekly dance parties. Rio Scenarium stage from the third floor, photo by Ik's World Trip's/Flickr Creative Commons License. For those looking for more traditional Brazilian sounds, Rio Scenarium sets the standard for great dancing in Lapa. The club has multiple floors where samba, forro, and mpb (Brazilian pop) to pack crowds that regularly fill the club, ready to dance the night away. Recently, Rio Scenarium branched into different areas of the musical spectrum, jazz. At Santo Scenarium, conveniently located adjacent to its Rio brethren, visitors can enjoy world-class jazz Thursday thru Saturday. Santo Scenarium has great dining and a good vibe and is decorated in the same eclectic manner as Rio Scenarium though with a focus on historic relics. Carioca da Gema, in the center of Lapa, enjoys a special reputation among music-appreciators. The space is more intimate than Rio Scenarium and focuses mainly on traditional samba. Great musicians and friendly atmosphere keeps local coming back and visitors to the area stopping by. Like Rio Scenarium, it is a great place to enjoy a drink and try out your samba steps. A group of French tourists, caipirinha in hands, at Carioca da Gema summed up the magic of the area, “Is really cool, cool people, nice music, cool.” Cool seems to be the word for visitors to Lapa. The city of Rio if full of great bars and restaurants to have a fun night out with friends. Still, Lapa continues to be a place of pilgrimage for those who want to experience all the great live music the city has to offer in an area that never stops enjoying life.